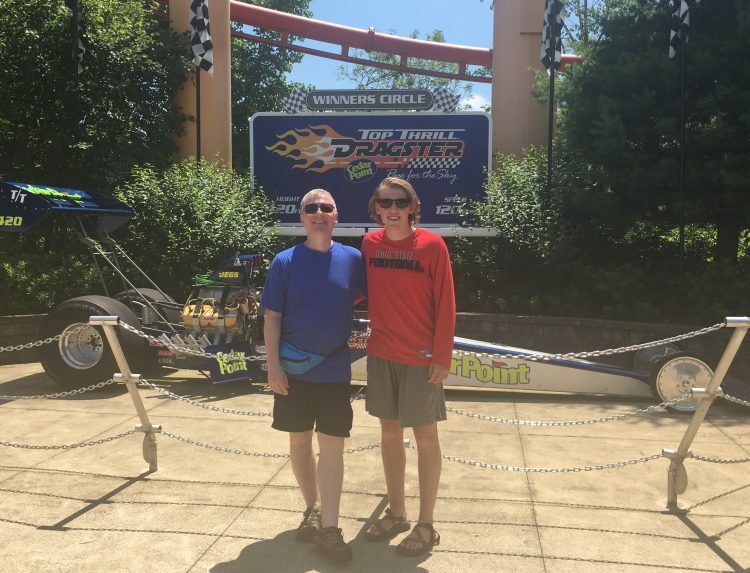 Home » Interests » Theme Parks and Zoos » Cedar Point picks up speed, and not just on Steel Vengeance! Growing up in Ohio, summer trips to Cedar Point with friends were a right of passage. 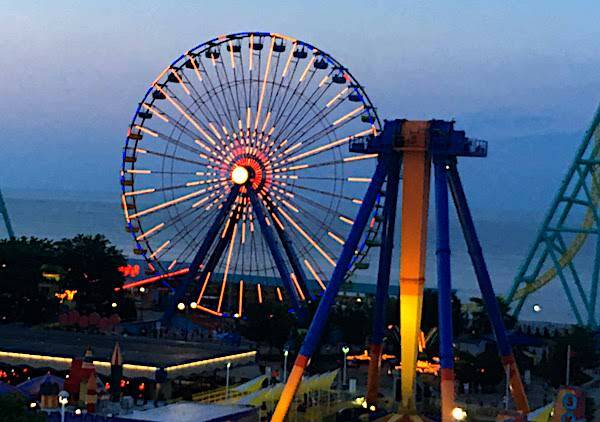 We’d get up before sunrise and drive two hours for a day of thrills at the world’s best roller coaster park. We would run through the park from coaster to coaster to ride as many as we could. Then, late at night, we’d drive home — exhausted and happy. I wanted my kids to know the magic of this amazing park. So, in 2006, on a trip home to Ohio to see family, we took the kids to Cedar Point. Only Nathan was big enough to ride all the coasters, but we were still excited to go. The day turned into quite a disappointment. 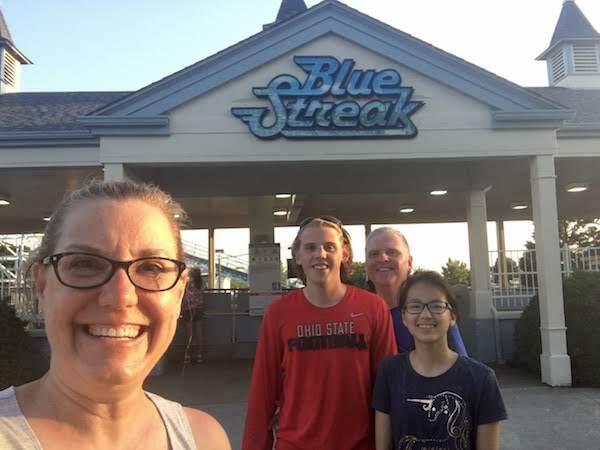 Nathan, our adventurous first born, loved the coasters — even braving Top Thrill Dragster (I couldn’t watch). But, the rest of the park was not what we remembered. Walkways were dirty, with gum stuck to the ground everywhere. The bathrooms were a mess. There wasn’t much in the way of landscaping. For thrills, it couldn’t be beat. But, I was sad to see how “old” and “tired” it looked. When we had the chance to go back this summer, I was prepared for a ho-hum atmosphere and great rides. Ellie is finally tall enough to ride them all, and she’s a serious adrenaline junkie. What about Top Thrill Dragster? There’s more than roller coasters? We passed through the turnstiles into the park, and the Midway surprised me. 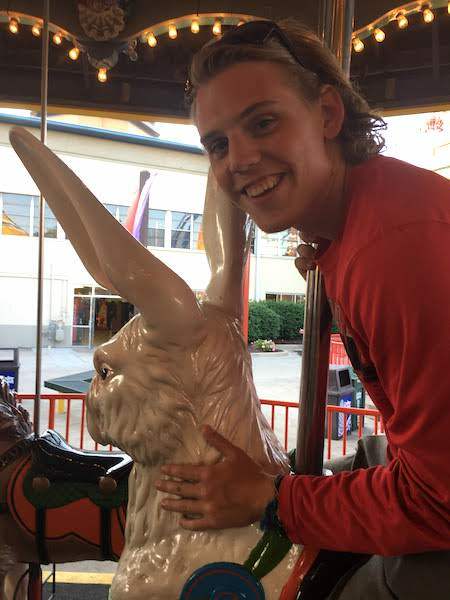 YES, we all change over the course of time, but I didn’t know if Cedar Point could get the magic back. They did! The landscaping is beautiful. The park is pristine — not one piece of gum on the sidewalks. It’s not as lush as Busch Gardens in Williamsburg, but not even Disney lives up to that! My expectations for the day grew. And I was not disappointed. The food was better than I remembered. The bathrooms were clean all day long. The staff was friendly, especially Becca from Long Beach (but more on her in a moment). When you visit the #1 roller coaster park in the world, the toughest decision is which coaster to ride first. I wanted to ride Gatekeeper, but Raptor was right there, almost begging us to ride. So… Raptor won first ride honors. We loved it! Then we headed across the midway to ride Gatekeeper, new to the park since our last visit. Not to sound redundant, but we loved the smooth ride and sense of flight. It’s one of my favorite coasters ever. 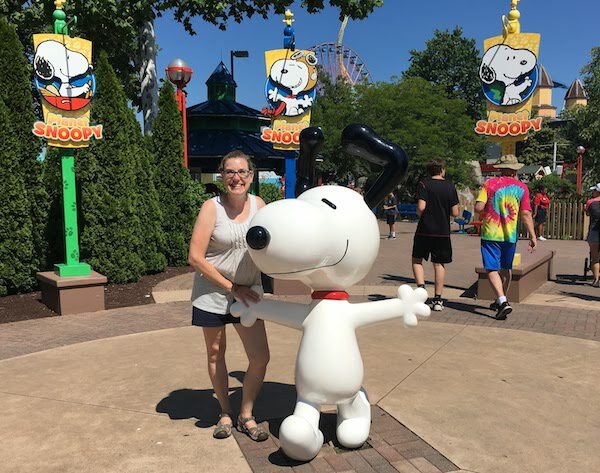 From there, we walked through the Lakeside Midway, my husband and I reminiscing about the past, as we made our way to this year’s big thrill: Steel Vengeance. We had trouble finding the ride entrance — it’s tucked back in the corner across the tracks behind Frontiertown. Staff at the ride entrance pointed us to a locker storage area — all bags, including fanny packs, are forbidden on Steel Vengeance. That space was a madhouse and the locker rental process was annoying. FYI: They change the layout of the keypad, so when you enter your security code, don’t go by pattern. Make sure you punch the numbers in carefully. Sounds like a silly warning, perhaps, but we weren’t the only ones who missed the pattern problem. Bags stashed away, you can enter the queue. But, early in the day, they aren’t accurate on wait times. We had rented a locker for two hours and wandered through the queue until we caught up with the line. At that point, we met Becca from Long Beach who patiently explained it would be three hours — at least — before we actually got to ride. Her smile plastered firmly on her face despite some guests’ grumbling, she patiently explained why. 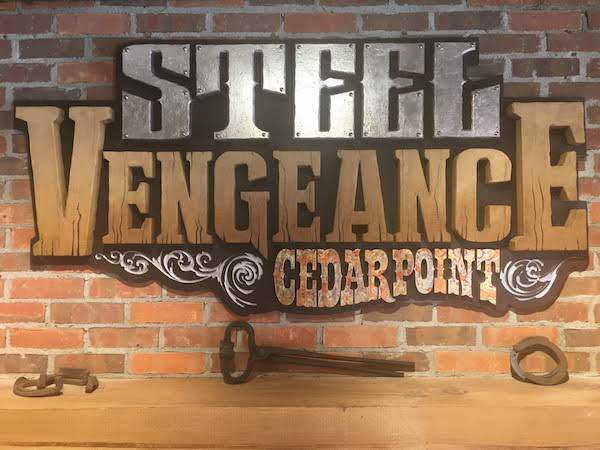 Steel Vengeance is usually included in early entry for guests of Cedar Point hotels. Because of the ride’s popularity and maintenance needs, the park has elected NOT to open Steel Vengeance early on Tuesdays, Wednesdays and Thursdays. We were there on a Thursday, so everyone who had wanted to ride early was already in line waiting for the ride to open. That translated to a three hour wait. Becca recommended that we come back mid-afternoon when wait times usually drop to about 90 minutes. She said after all the people who come to the park just for that ride get it in, the wait times drop. That sounded good to us, so we pulled out of line. We went to our locker, made peace with the wasted rental fee, and got our stuff. I checked the Cedar Point app during the afternoon and saw that wait times had, in fact, dropped. We made the trek to the back of the park to try again. And we waited — for 90 minutes — just as Becca said. When we got to the stairs leading up to the loading deck, I watched the ride fly along the tracks. As it comes around a turn, the entire structure sways a bit — unnerving? Yes. And no. It’s a wooden structure, so logically, I know there needs to be some give or the boards would snap. At the same time, the power of the ride is right there on full display. If you get squeamish, don’t look up! Oh my goodness, YES! I wish I could put to words what this ride is like, but it defies description. The first drop is terrifying in all the right ways. We loved Steel Vengeance for the thrills. The first drop is terrifyingly awesome in all the right ways. As the coaster zips through twists and turns, riders scream with delight. Some, probably, with fear. I screamed in a mix of both! But, to describe it? I can’t. Rob and I agree that Steel Vengeance is the BEST roller coaster we have ever ridden. When I asked Rob, his reply was, “Oh yeah. Without question.” Ellie is loyal to her Griffon at Busch Gardens, but says, “Steel Vengeance is second best. If I could go more, it might be the best.” She’s a practical girl. Ben was more quiet, but I’m pretty sure it’s his favorite. He gets motion sickness, so he doesn’t ride as much as we do. What about that no bags policy? Is it a gimmick to get people to cough up a few bucks for a locker? Nope! There’s no way riders can hold on to bags through the whole ride. Fanny packs would not allow riders to be properly secured. It’s not a gimmick. Leave the bags with a non-rider — and your cell phone, too! We spent the rest of the day riding coasters old and new. Some were amazing. Others, well, I think they need to go the way of the Mean Streak and retire. Since Ellie loves coasters so much, we rode them all, except Gemini which broke down during the day. Some brought back fun memories, but some…. well, you’d have to pay me a pretty penny to convince me to ride again. Rougarou. This coaster opened in 1996 and was renovated in 2015, at one time the tallest, fastest and steepest stand-up roller coaster in the world. Warning signs tell people to remove earrings before riding — and we know why. Wow! My head banged around way more than I like. Ellie liked it. Rob and I will let her tackle that one on her own in the future. Iron Dragon. This coaster is fairly mild, but a little herky-jerky for my tastes. I do like that they’ve transformed it to a virtual reality experience in the evenings, but the line moves slowly. In our opinion, Cedar Point could replace this with a “real” virtual reality ride that loads more quickly. The retro-fit is just too slow. Ben doesn’t want Iron Dragon to be replaced because it’s the only roller coaster he wasn’t afraid to ride when he went as a kid. Corkscrew. We walked right on to this ride, no lines at all! We climbed into the car — so uncomfortable. But, with knees to chin and smooshed in by the shoulder harness, we braved it for Ellie. And regretted it for hours after. I remember how, as teenagers, we thought the 1980s font and the excitement of going upside down three times, over the midway no less, was so cool. But, that’s a memory best left there. Not relived. Of all the coasters, this one needs to give up the real estate to something fresh and new. And then there’s Blue Streak. How do you classify a wooden coaster that’s older than you are? Barely, but still, older. It’s the first roller coaster I ever rode at Cedar Point, honestly, because I was a chicken back in the day. Today, it’s rickety. There’s never a line. It breaks down a lot. But… when you ride in the front, it’s scary fun. You watch the track cruise by under your nose wondering if the whole contraption will collapse right there. But, then it’s over, and you find yourself giggling — in part from the memories reignited and in part because you survived. I will always love the Blue Streak. Do you hear that, Cedar Point? Don’t mess with this memory! On the flip side, “America’s Roller Coast” earns its reputation with its record-breaking coasters. And since we were there on a Thursday, we got to ride most of them multiple times! AWESOME! Gatekeeper. Oh, Cedar Point. Where has this coaster been all my life? I absolutely love Gatekeeper. First, there’s its location — on the beach with epic, albeit brief, views of Lake Erie and crossing into the entry plaza for the park. It’s a mighty presence that reminds guests of the thrills just beyond the Midway. Gatekeeper’s relaxed, beachy color scheme, which at first seems strange for a super-coaster, actually fits the smooth ride. Despite holding the record for highest inversion of any roller coaster in the world, the ride is so smooth I actually relax and enjoy the feeling of weightlessness. Gatekeeper is the only roller coaster to hold that distinction! Maverick. 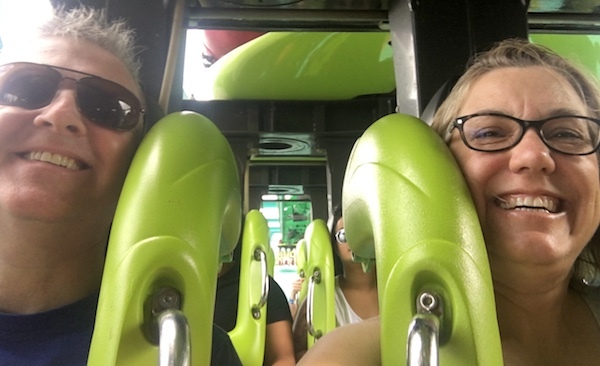 This is one wild ride, with a 95 degree drop that messes with your senses. 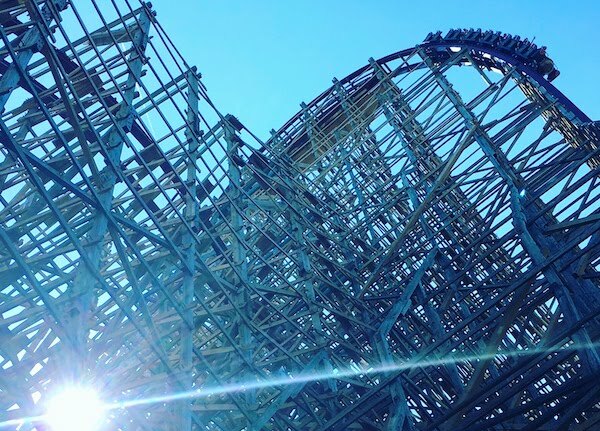 Maverick is open for early entry on Tuesdays, Wednesdays and Thursdays when Steel Vengeance isn’t. Morning lines are long, so go later in the day. Though, it is a ride worth waiting for. Magnum XL-200. Better known as Magnum (which I think is a better name anyway), this coaster has dominated the skyline since it opened in 1989. It’s tall, long and really, really fast — and loads of fun. 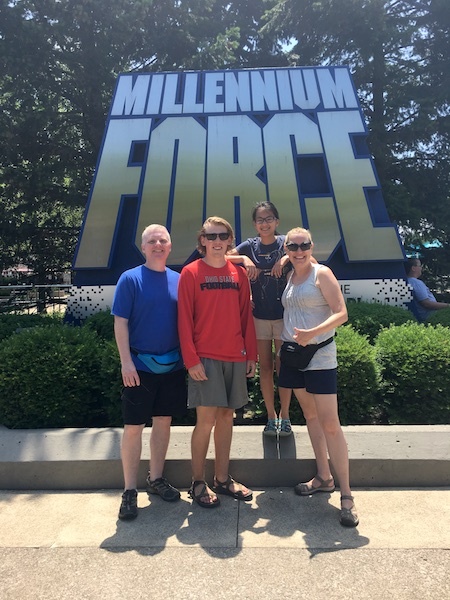 Millenium Force. 300 feet high. 93 miles per hour. Two and half minutes. Need I say more. This ride is long, fast and fierce. Ride it once for the fear, then go back again for the thrill. Raptor. Ellie’s first ride at Cedar Point will probably be her favorite forever. She’s loyal to her memorable thrills. The ride is incredible, but a warning. Don’t ride late in the day if you don’t feel 100%. The ride had short shut downs twice the day we went because people got sick. A park staffer said that it happens later in the day when people have been drinking beer or are dehydrated. Avoid those two situations, and Raptor will thrill you in all the right ways! 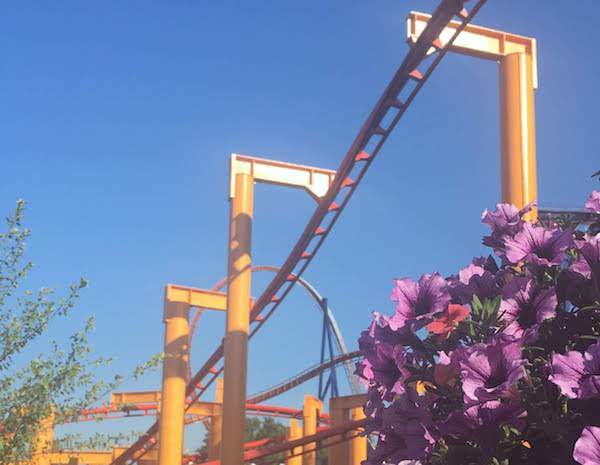 Valravn. This is one of my absolute favorite coasters at the park. It seems I have a preference for dive coasters (funny, since I can’t dive into a pool even to save my gym grade… long, painful story for another day). 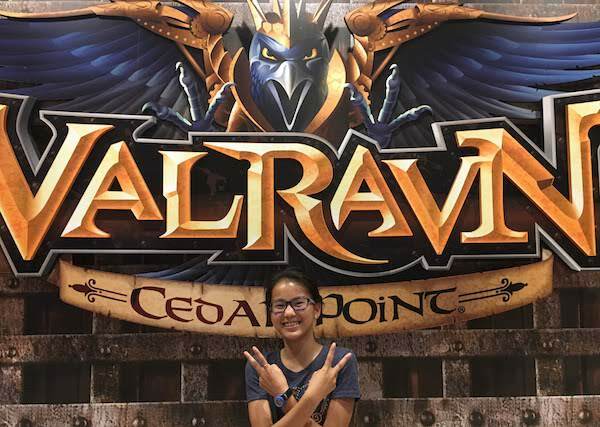 Valravn was built by the same company that built Griffon, my favorite ride at Busch Gardens. The suspense of the hold before the big drop is a thrill I’ll never tire from. Throw in the added twists and swoops and this is a coaster worthy of the #1 roller coaster park in the world. Ahhh… Top Thrill Dragster. What is it about you that intimidates so many? We were firmly divided on this one. Surprisingly, Ellie was in the no column with me. Ben thought he’d give it a go. I just can’t wrap my head around the speed — 0 to 120 mph in just 4 seconds? No thanks. Ellie and I watched ride after ride from the nearby grandstands, not the least bit tempted to ride. We learned a few things, though. First, the ride won’t launch if you have your hands raised. I guess Cedar Point doesn’t want you to dislocate your shoulder! Second, if you’re riding with kids, PLEASE don’t let them ride with their head hanging out to the side. The only thing worse than a dislocated shoulder would be a dislocated head! I honestly almost lost my lunch wondering if a couple kids would pull their heads in in time. I don’t think the ride safety crew can see them. Third, I will never be a race car driver or a Top Thrill Dragster rider! A side note: The grandstands offer great views of the ride, but they sit in full sun and get really hot! If you are waiting on loved ones to survive the ride, have them text you when they get close to the loading deck so you can sit in the shade some of the time! We had the guys’ phones, so we just roasted in the sun. 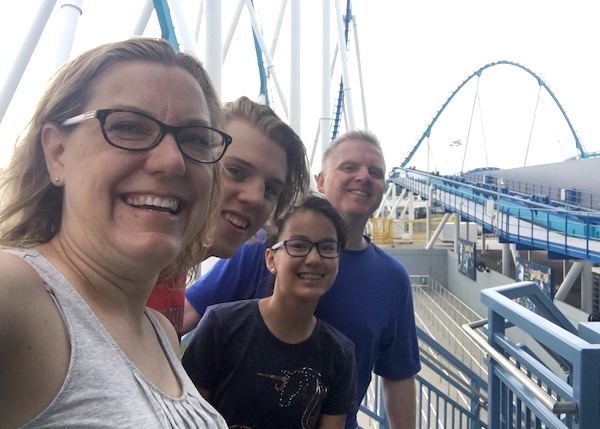 My kids grew up with Walt Disney World and Busch Gardens Williamsburg. Both places are incredible. But, the one thing they don’t do well is capture the excitement of an amusement park after dark. Don’t get me wrong, I absolutely love the Magic Kingdom fireworks show (even if the crowds are insane). But, Cedar Point after dark is a whole new level of fun. Ben was skeptical, ready to head back to the hotel by 7:00. He tried arguing that we had ridden everything at least once, most things twice. When that didn’t work, he tried to remind us that our hotel had a pool and hot tub. I ignored him. He had no idea what he was suggesting. And then twilight fell. Ellie wanted one more roller coaster ride, so Rob took her. Ben and I rode the Sky Ride to pass the time (though I knew even more). As the ferris wheel came into view, I pointed a finger. No words. “Oh my gosh, that is cool,” he said. And I knew he understood. We got off the Sky Ride and got cotton candy as we soaked in the twinkling lights and energy of summer nights at Cedar Point. 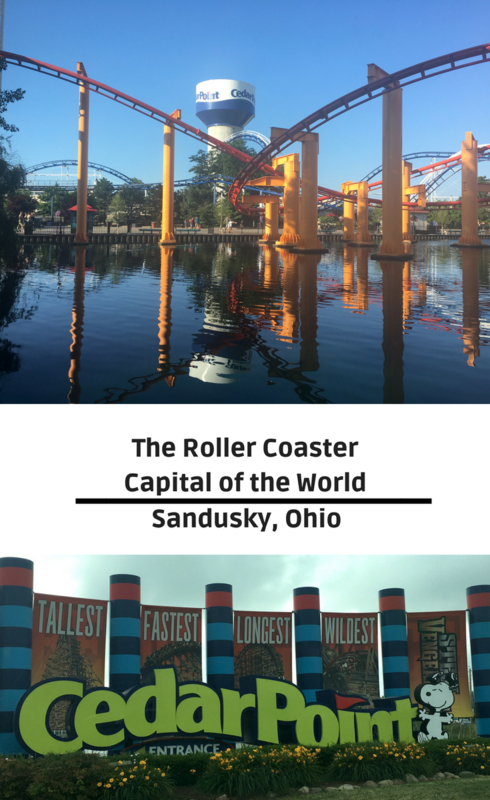 Hmmmm… I feel I should tell you there’s more than roller coasters at Cedar Point. The park has 72 rides, only 17 of them are roller coasters. There are the thrill rides, built to give you butterflies as you spin around: Scrambler, the flying swings, Matterhorn. 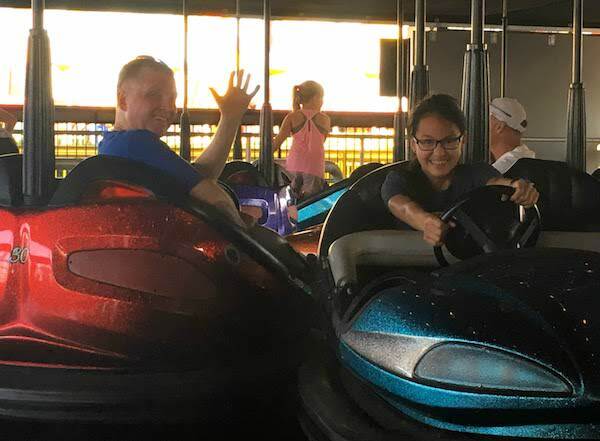 Cedar Point has two Dodgems rides — one for big people and one for kids (Joe Cool’s Dodgem School). A little family secret, we always ride the Dodgems at theme parks — and we try to pick a car based on our personal Hogwart’s house colors! Yes, this obsessive Hufflepuff always tries to get the yellow car. Ellie, the Ravenclaw, gets blue. Rob, my Gryffindor, gets red, of course. We spend three minutes ganging up on each other and laughing hysterically! The water rides. You can get tickets for Cedar Point Shores, the waterpark adjacent to Cedar Point. Or, you can cool off on one of the park’s two water rides. Rob’s not big on water rides, so we skipped them this time around, but I think they’re fun even if he doesn’t! And then there are Cedar Point’s midway staples, the Sky Ride and the carousels. In fact, Cedar Point has three “carousels” of sorts. The Midway Carousel is the grand dame, built in 1912 and moved to Cedar Point in 1946. It’s the oldest ride at the park and is listed on the National Register of Historic Places. 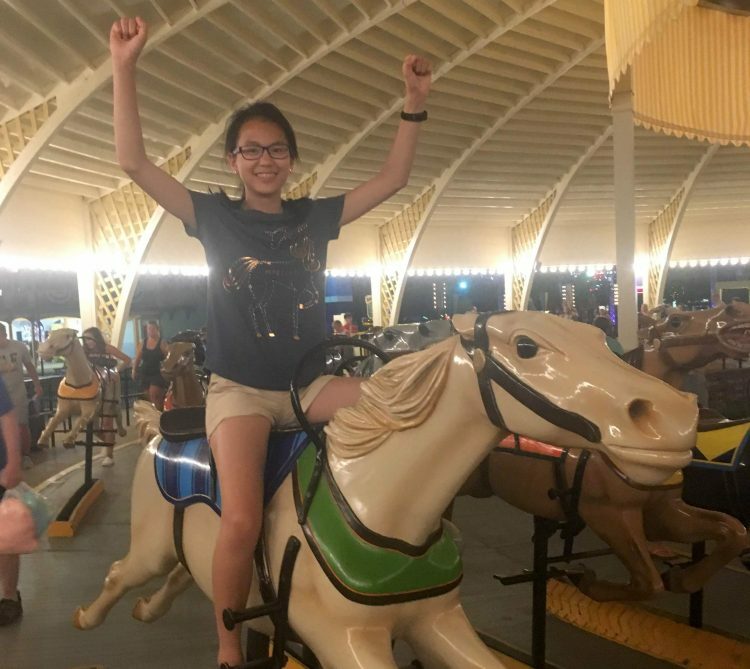 The Kiddy Kingdom Carousel (also on the National Register of Historic Places) is located near the Midway and geared more for kids, but big people can ride too. And then there’s the Cedar Downs Racing Derby. Built similarly to a carousel, but with a horse racing theme, this historic 1920 ride has entertained guests at Cedar Point since 1965. We ran to it just before the park closed to catch a ride, and laughed so hard I had tears in my eyes. For the record, Ellie’s horse won. And, she ranks it in her top five rides at Cedar Point. The park has two children’s areas: Kiddy Kingdom (opened in 1970) and Planet Snoopy (opened in 2008). Combined, they provide 18 kids’ rides, plenty to entertain little ones all day long. There are several Peanuts themed shows at the park and character meet and greets throughout the day, too. Compared to Kings Island, there isn’t as much shady space for families, but it’s a lot better than it was the last time we visited. Cedar Point leans toward traditional theme park fare of hot dogs, burgers, pizza and fries. There are some fast casual restaurants, and the park offers dining plans. We didn’t get a dining plan, but if I was to go again, I’d get the single meal plan which includes a main dish, a side and a drink for each of us. The park offers other dining plans, too, but they’re a good value only for big eaters. 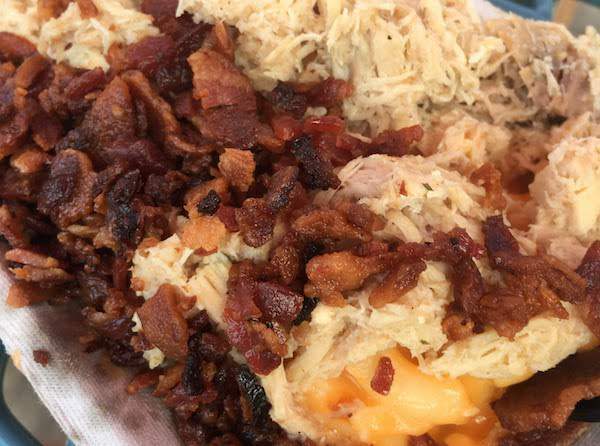 With so many dining options, we looked for something a little different and tried the loaded mac ‘n cheese at Sky Ride Refreshment. Ellie and I split the chicken and bacon mac ‘n cheese, which was pretty good. The chicken was bland, though. The pulled pork mac ‘n cheese was more flavorful, thanks to the tangy barbecue sauce drizzled across the top. The restaurant staff here was disorganized, thogh, and they let our order sit until it was cold. Not the best meal I’ve ever had. Money saving tip: Be sure to download the Cedar Point App before you go! We downloaded it to keep track of Steel Vengeance wait times, but then we discovered the coupons. We got BOGO coupons for beverages, soft pretzels and cotton candy. For a family of four who likes to snack, those were a great budget stretcher. 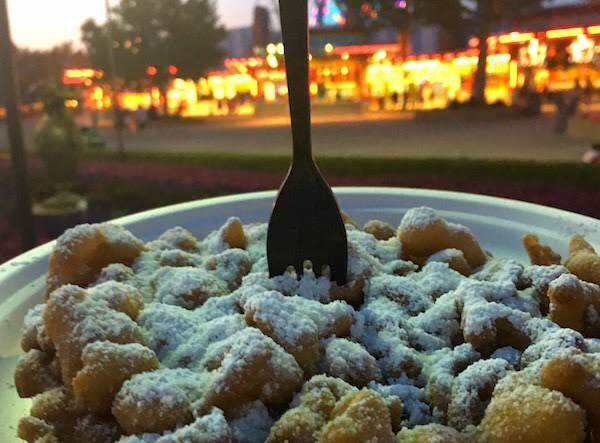 We closed out the day with a funnel cake — my absolute favorite theme park treat. No coupons, but it was hot, fresh and crispy, and worth every penny! My kids finally got to experience the thrills of the park. They got to see how mesmerizing the midway is after dark. And they got to ride Steel Vengeance. This was a day for our personal record books, one filled with treasured memories and fun moments to last a lifetime — or at least until the next big adventure! Cedar Point is located at 1 Cedar Point Drive in Sandusky, Ohio. If interested in a vacation package that includes accommodations, park tickets and/or water park tickets, check the website. Purchase tickets online — they’re a lot cheaper than at the gates. If you get a hotel vacation package, tickets will be included. 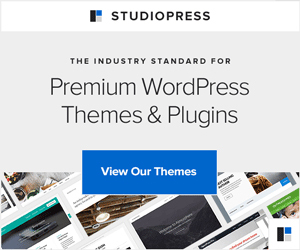 Decide if you want to purchase fast lane or fast lane plus passes. One thing to note, while these passes cut wait times, they do not eliminate them. Fast Lane Plus riders still waited 30 minutes to ride Steel Vengeance. We went on a Thursday and rode everything at least once without the passes. Decide on a meal plan if you want one. Purchase a parking voucher — the sooner the better. Early in the season, you can save $5 on general parking. As summer progresses, that savings shrinks. We saved only $3 on our parking pass. Though, that’s better than nothing! Cedar Point also offers combination ticket savings if you plan to go to Kings Island and Cedar Point the same summer. 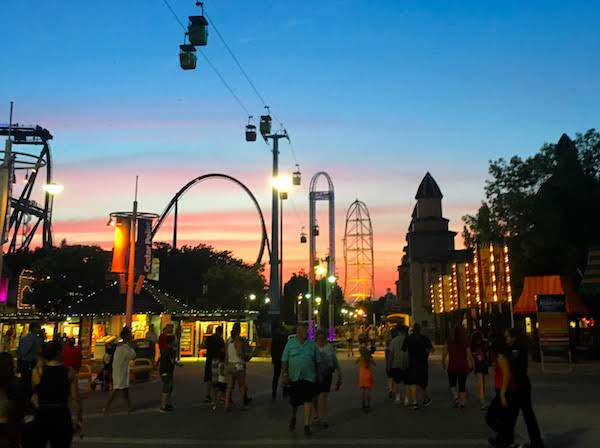 Or, if you’ll be in the Cleveland area, there’s a great combo ticket that includes Cedar Point, the Rock and Roll Hall of Fame and The Pro Football Hall of Fame. Cedar Point hosted our visit to the park for purposes of this review. All opinions in this post are ours.